Get your product name or business out to the public! Our Policy: All Vendors must comply with rules established by the management of Horror Sideshow Market and the host venue, Merchant Square . 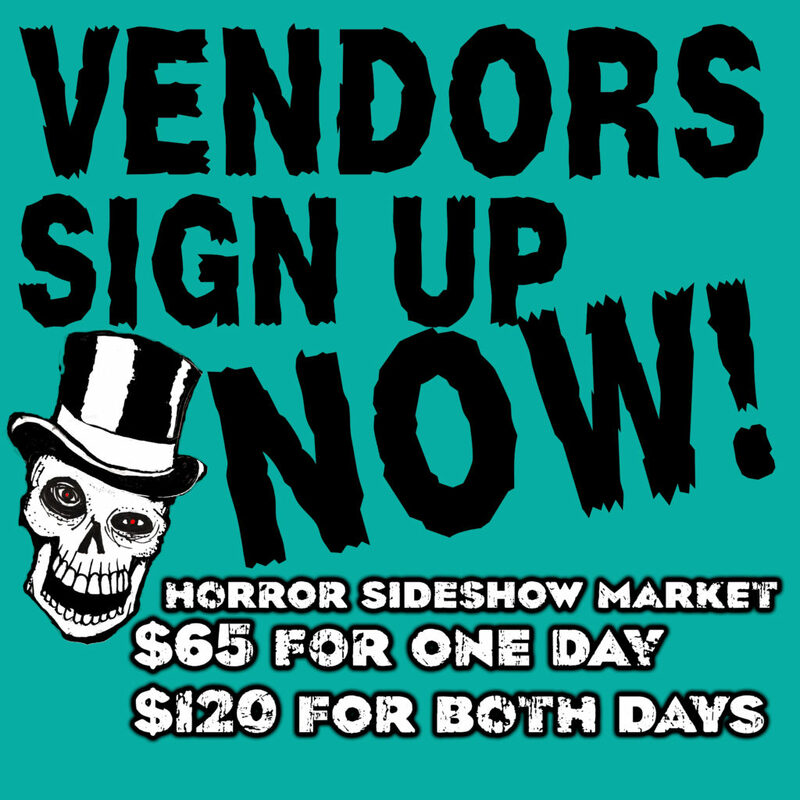 Vendors should notify Horror Sideshow Market at the time of registration if wall space will be needed. Vendors may not use anything that will damage the walls. Vendors will be held responsible for any damage that they cause. Vendors will not use anything other than blue painters tape to affix displays to the walls. HSM reserves the right to refuse to allow displays or the sale of merchandise that it determines to be dangerous or offensive. If you are concerned about whether your display or merchandise may be considered dangerous or offensive by HSM management please contact us prior to registration for pre-approval. HSM in no way supports, warrants or endorses any merchandise, exhibits, views, beliefs or actions displayed, offered, sold or taken by any Vendor. Vendors acknowledge and agree that they participate in the Horror Sideshow Market at their own risk, and that HSM does not make any representation or warranty with regard to any matter relating to the Horror Sideshow Market, including without limitation, foot traffic or sales volume. Vendors shall indemnify, defend and hold harmless all members, volunteers, workers, employees and agents of Horror Sideshow Market and the Merchant Square and their respective successors and assigns from and against any and all loss, cost, damage, liability, theft, expenses, claims or actions of any kind or nature arising from any personal or property damage, loss or theft arising in any manner from participation in the Horror Sideshow Market. As part of the registration fee, each Vendor shall be provided with TWO (2) weekend passes for the table purchased. All Vendor tables must be operated by at least one person during the entire time that the Vendor Room is open to the public for show. HSM reserves the right to require any Vendor remove themselves from the venue and forfeit their registration fee for non-compliance with the rules established by HSM or the Marchant Square . Vendor acknowledges and agrees that Marchant Square may assess separate penalties for failure to comply with the rules established by the venue.